remove the seeds from your red bell pepper and chop it into super small pieces. dice half of your red onion. add both to a pan with four or five big splashes of white vinegar, five or six heaping spoonfuls of sugar, black pepper to taste, and a hearty amount of red pepper flake. i like to add a little bit of cumin as well, but i’ll leave that up to you. bring the mixture to a boil while stirring to make sure the sugar doesn’t burn. once boiling, reduce the heat as low as you can and allow the sauce to simmer uncovered for another 15 minutes or until it reaches your desired texture. make sure to stir it the whole time or it will take on distinctly burned taste. and nobody wants that. once nice and thick, pour the contents into a glass jar and stash it in the fridge for later use. slice your sweet potato into rounds as thin as you possibly can. i tend to angle the sweet potato so i can get nice big chips, but i’ll leave the size and shape up to you. just remember, the thinner they are the quicker they cook and the crisper they will be. put some frying oil in a pot or pan, bring it up to medium high temperature (remember, you don’t want the oil to smoke) and drop one chip in. if the chip immediately starts to sizzle, they oil is hot enough. if not, give it a little bit of time. don’t add too many chips as once or it will dramatically decrease the oil temperature and turn your chips into a soggy oily mess instead of the magical crispy wonder they should be. as each batch of chips finish, toss them onto a plate covered with a few layer of paper towel and sprinkle them liberally with garlic salt, cumin, and black pepper. 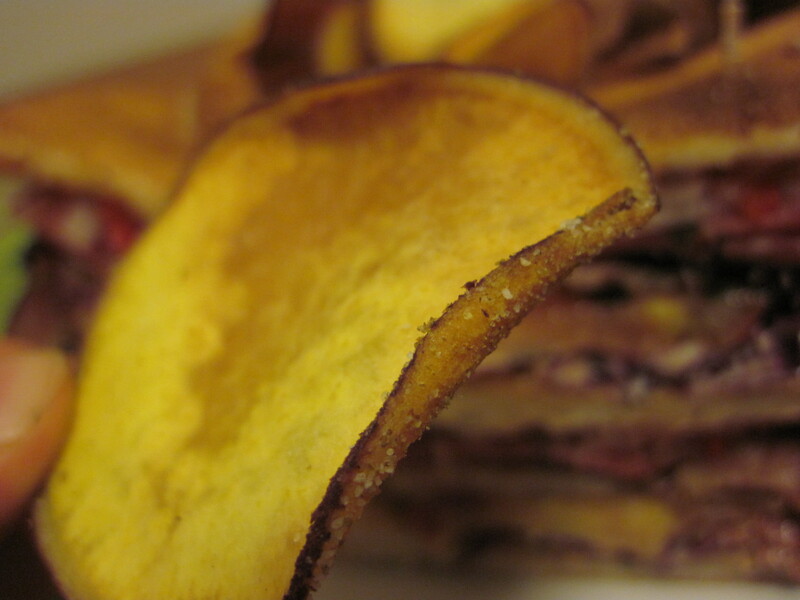 don’t stack batches of chips on top of one another or the excess oil will seep through and they will end up soggy. fry the bacon in a nice hot pan until it is crispy. i like to slice my bacon into rounds or small squares before frying as opposed to strips. strips tend to pull through the sandwich and give you a mouth full of bacon, and while that particular bite is delicious, it deprives the rest of the club of bacony goodness right off the bat, and nobody wants that. place your bacon on a layer of paper towels, and then put another layer of paper towels on top to soak up the extra grease. add some mayo to a small sauce bowl and mix in some black pepper, cumin, salt, and chili powder. mix well and set aside. rinse the sprouts with cold water. chop off the root structures and drain them in a colander. set them aside for use in a few minutes. put your bread in the toaster (or toaster oven) and make sure to take it out before it hits that hurts-your-mouth-it-is-so-crunchy level. overtoasted bread is exactly what you don’t want on this sandwich. this part is important, so pay attention. break a few leaves off of the purple cabbage and make sure to remove the thick pieces of stem at the bottom of the leaves. once rinsed and dried, stack the leaves and slice them as thin as humanly possible. 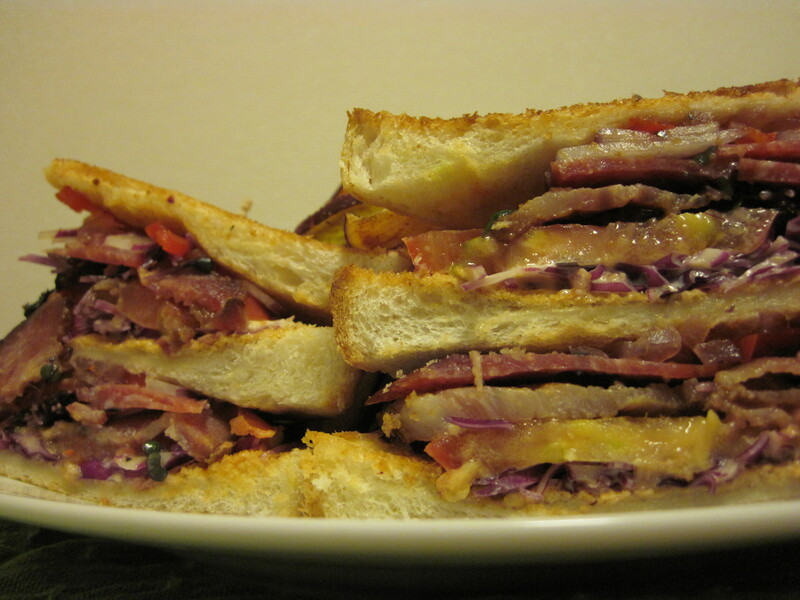 cabbage on a sandwich can be a dangerous proposition because of its intense crunch and super strong flavor. super thinly sliced cabbage will assure that all the flavors on your sandwich shine through while still providing that essential crunchiness leafy veggies are known for. rinse off the tomato and slice off five or six thin rounds with a very sharp knife. do the same with your salami. on the bottom piece of bread, add the following in order: a layer of spicy mayo, thinly sliced purple cabbage, tomato, bacon, sprouts, salami, and red onion. spread a copious amount of red pepper relish on a piece of toast, and set it on top of the stack. then, add spicy mayo to the top of this piece of bread, and repeat, closing off the whole sandwich with the last piece of bread spread with red pepper relish. push down on the sandwich to compress all of the excellence a little bit. cut the sandwich from corner to corner with a super sharp knife, and then once more to make the halves into fourths. fasten each with a toothpick, and place them on a large plate point out (with the crust-side facing in). there should be a square space in the middle. into that gap, pile as many sweet potato chips as you can fit. they have waited patiently all this time, they deserve to be rewarded. serve this magical sandwich with a small bowl of both the leftover spicy mayo and the red pepper relish. everybody loves to dip their chips in something, and to bring ketchup anywhere near this sandwich would be a crime of unforgivable proportions. note: if you want to make this club into something super amazing, marinate your red onions. cut them like you normally would, only add them to a small plastic bag containing a marinade of a few spoons of balsamic vinegar, some olive oil, crushed garlic, salt, pepper, and red pepper flake. you don’t need a whole lot of marinade, just enough to mostly cover the onions (which is why a small plastic bag chock-full is a good idea). give the onions a good shake, and set them in the fridge for a few hours. when you sandwich is almost ready, take them out and use them raw or give them a quick sear in a frying pan. your choice.